In recent years, there has been a growing interest in LED lighting, which has higher luminous efficacy and lower power consumption than conventional LCD-type lighting, and can be used for a long time. However, it is difficult to design a fully automated assembly line to replace the manual process of assembling by hand due to various sizes and designs in the existing production process of LED lighting. This phenomenon is especially noticeable in the LED fusion lighting market, which is in the spotlight recently. In response to these market changes, the standardization of general LED lighting and LED fusion lighting accessories is in progress to enable production with minimal manual operation in the assembly system. Furthermore, LED fusion lighting is being developed as a single panel. LED fusion lighting is a so-called emotional lighting, which is a combination of excellent light emission characteristics of LED lighting and five-sensor technology. Particularly, in the case of LED fusion lighting, since the defect rate occurring in the existing process is relatively high, the process improvement is urgently required. The LED fusion lighting automation assembly system refers to a system that automatically assembles various parts by mounting panel type LED fusion lights on the pallet loading jig and transferring them through the main conveyor. In this process, when assembling the module power supply of the existing LED fusion lighting, there is a problem caused by the connection through the wire that is not fixed exactly, which is directly related with the defect rate of complete product. Most of the researches about solving the problem of automation system of LED fusion lighting are focusing on the problem caused during the transferring of LED panels through pallet loading jig. There are few studies focusing on the module power supply. Therefore, this study was focusing on complementing these problems and redesigning the module power supply of LED fusion lighting. Based on this, the final developed LED fusion lighting was fabricated and the optical characteristics were analyzed to prove the superiority of performance standard for high-efficiency energy equipment certification. In addition, by developing a pallet loading jig optimized for the developed LED fusion lighting, it was ultimately aimed to enhance compatibility with the LED fusion lighting automatic assembly system, and further to expand compatibility with various LED auto assembly systems. In the conventional method, since the position of the wire is not fixed, there is a problem that the product is not properly connected in the automatic assembly or the wire is broken due to the bending of the wire. In order to solve this problem, the first structural improvement was carried out as shown in Fig. 1(b). Conventionally, since the space between the connection terminals is narrow, there are frequent problems in the process of bending the wires. In order to improve this, a type of wire connector for power supply was adopted by widening the space between the connection terminals so that the terminals can be connected to each other by a straight line. However, in the process test, a wire warping phenomenon could be observed even though the wire was connected in a straight line by the wire connector, resulting in poor soldering position. In order to prevent the warping of the connection part, the structure improvement was carried out by using the iron type connector as shown in Fig. 1(c). According to the inherent characteristics of the iron type, it is confirmed that the warping phenomenon is remarkably lower than that of the wire connector type due to the excellent electric conductivity and the large area. However, unlike the wire connector type, frequent breakage could be observed due to the fact that the area where the electricity is conducted is exposed to the outside and that the rigidity of the iron connector material are not homogenous. A relatively wide conductive area was designed to prevent the warping phenomenon. However, this method was found to lower the electric stability. Considering these problems, the structure was finally designed as shown in Fig. 2(c) and made by FR4 material. The final product was shown in Fig. 1(d). Due inherent flexibility of the FR4 material, warpage and disconnection phenomena, which were the problems of conventional methods, were solved. In addition, by using FR4, which is the same material as the LED module and the power connector, the problem of breakage was solved, and high electric stability was maintained by simplifying the circuit line inside the FR4 connector. In the case of LED flat panel type lighting, the accuracy of position of components is important in the assembly process for automatic assembly of components. Therefore, black circles were displayed on the surface of the LED module for locating precise position using the machine vision video system and the motorized stage interface, thereby to improve the accuracy of work in the assembling process. Fixed bolts, which automatically adjust position errors during rotation, were used. In the design draft, six circle lines of LED modules were planned as shown in Fig. 3(a) In order to optimize the positional accuracy during the bolting and soldering, totally 11 circle lines were constructed (Fig. 3(b)). Starting from the improvement of the design of the power supply part of the LED fusion lighting module described above, the design of the LED fusion lighting module was newly reflected in the existing LED fusion lighting drawing. The improvement and complementary design of the overall LED fusion lighting structure were then carried out. Finally, the LED fused lighting pallet loading jig optimized for process automation was developed. Pallet loading jig is a critical device for automatic assembly system of LED fusion lighting. It helps to solder and assemble parts in a state where LED fusion lighting panel is fully fixed during automatic assembly. In order to assemble precisely, it is important to design the module so that no shaking or clearance occurs in the vertical and horizontal movements, and the most important thing is to accurately transfer the LED panel to the auto assembling position. Considering these characteristics, the pallet loading jig of the LED fusion lighting is designed as shown in Fig. 4(a), considering the position and size of the redesigned parts. The combination of the designed pallet loading jig and the LED fusion lighting is shown in Fig. 4(b), and the pallet loading jig was manufactured based on this. In addition, the block is processed to connect the power to the upper part, that is used to guarantee the position accuracy of the LED lighting. The pallet loading jig acts as a support for automatic assembly and is designed to be assembled in a precise position so that the appropriate parts can be assembled and it is designed and manufactured to be easily attached and detached from the LED fusion lighting for automatic assembly. Based on this design, a self-test was conducted and it was found that the defect rate was reduced by about 17%. 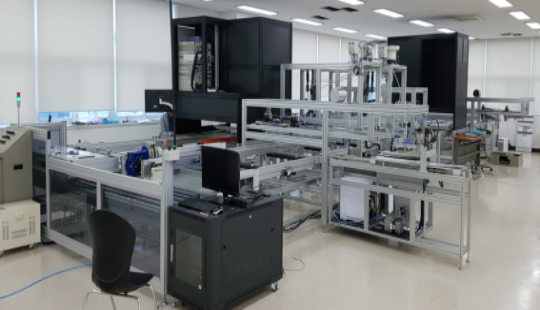 The optical characteristics of the designed LED fusion lighting were analyzed by the Korea Photonics Technology Institute for the reliability of the results. The characteristics measured in this study are based on the performance criteria for high efficiency energy equipment certification (Table 1). The color temperature and color rendering were measured by Spectroradiometer 2M equipment. The power consumption, harmonic content and power factor were measured by power analyzer, and the light efficiency was calculated by equation (1). The results of the characterization are shown in Table 1. As a result of the analysis, all of the six test items were confirmed to meet the performance standard for high efficiency energy equipment certification. Especially, the harmonic content of LED fusion lighting was 13.4% compared to that of 30% or less for high efficiency energy equipment certification. The characteristic value decreased by about 55% compared with the standard. 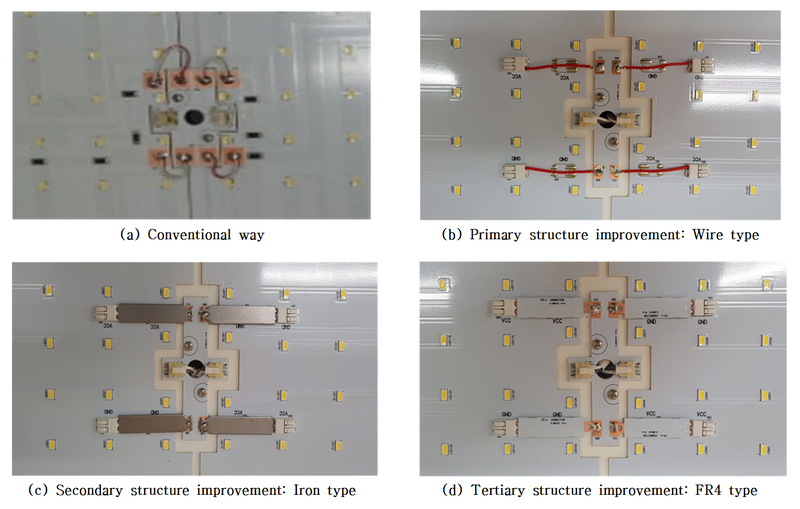 In addition, the characteristics of light efficiency increased by about 16.1% compared to the performance standard (100lm/W or more), and the LED fusion lighting for automatic assembly developed through this study satisfied all the performance standards for high efficiency energy equipment certification. Moreover, it was proved that the LED fusion lighting developed for auto assembly can be applied directly to LED fusion lighting field. In order to confirm the automatic assembly performance of LED fusion lighting for automatic assembly, output per line and defect rate were tested and evaluated. The equipment used for the test evaluation is the automated inspection and mass production assembly equipment for LED fusion lighting as shown in Fig. 5 The size of the equipment is 13600 x 5500 x 2400 (H) mm, and consists of assembly line part, aging part, optical (electrical) characteristic inspection unit, and conveyor drive unit. The output per line of the automatic assembly equipment was measured during unit time. Output per line were separated into four assembly processes: LED panel assembly process, fixing process, soldering process, and diffusion cover assembly process. The assembly time for each process was tested for three times, and the maximum assembly time was measured as the assembly time of each process. The defect rate of the automatic assembly system was determined by the criteria of acceptance of the inspection units. The defective product was made and moved on the conveyor and repeatedly measured by the inspection unit. As a result of assembling performance test, the production time for each process was 31 sec for LED panel assembling process, 32 sec for fixing process, 31 sec for soldering process, and 30 sec for diffusion cover assembling process. After each line, the final shipment of the product was recorded for a maximum of 40 seconds. 10 defective products were fabricated and the optical and electrical property were repeatedly measured by the inspection unit. Defective products may be artificially reduced in luminance or using color filters, Checking the change in the color temperature value We checked whether the defective product was recognized as defective products. In the defect detection standard of illumination(± 10%), color temperature(± 300K) and color rendering property(± 2), the automatic assembly defect rate of LED fusion lighting process was 0%. The module power supply of conventional LED fusion lighting was fabricated by wire, but fixation problems of wire often resulted in defects in the complete product. In order to solve the problem, two methods of wire connection change and iron wire connector type were proposed. However, fabrication process problems, such as warping of the connector, disconnection, and breakage of connector could still be observed. Finally, the problem of defect rate caused by connecting problem was solved by changing to FR4 type power supply and high electrical stability was ensured by simplifying internal circuit lines. It is also confirmed that the output of LED fusion lighting designed for automatic assembly is 92.3 set/hr per line. The whole design of LED fusion lighting was carried out according to the newly designed LED fusion lighting. In order to apply the redesigned LED fusion lighting to the automatic assembly system, a new pallet loading jig, which can be applied to the existing automatic assembly system and enable accurate and precise automatic assembly process, was also developed. The ultimate goal of the pallet jig development is to accurately assemble the LED fusion lighting during auto assembly and minimize the defect rate at the same time. According to the result of the self-test using the developed LED fusion lighting and the pallet jig, it was confirmed that the defect rate was reduced by about 17% compared with the existing product. According to the result of analyzing the optical characteristics of the developed LED fusion lighting, all 6 conditions of performance criteria for high efficiency energy equipment certification were satisfied. In particular, it was confirmed that the optical efficiency was improved by 16.1% compared to the standard. The design change of the module power supply of LED fusion lighting is supposed to improve the light efficiency compared to performance standard. The result of optical characteristics of the developed LED fusion lighting showed that all six conditions of performance criteria for high efficiency energy equipment certification were fulfilled. In particular, the light efficiency was confirmed to be improved by 16.1% compared to the standard. It is supposed that the light efficiency was better than performance standard due to the design change of module power supply of LED fusion lighting. The performance of the LED fusion lighting for automatic assembly system developed in this study was confirmed. It is expected to become a widely available technology in the market of direct under panel lights if the universality is verified through compatibility testing with various automatic assembly systems in the future. Mr. Moon is currently enrolled in Ph.D program in the dept. of IT Applied System Engineering at Chonbuk National University. His research interests include Led Lighting and Low pressure plasma system. 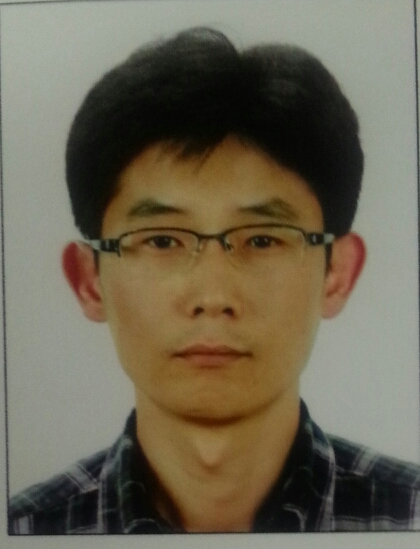 Mr. Choo received Bachelor’s Degree in physics from Soonchunhyang university. His research interests are Led Lighting measurement. 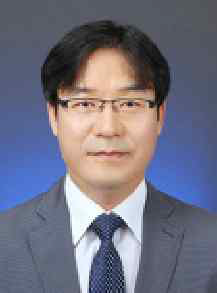 Dr. Bang is a professor at Major of IT Applied System Engineering of Con-vergence Technology Engineering Division and smart Grid Research Center, Chonbuk National University. His research interest include analog circuit and IT convergence system. 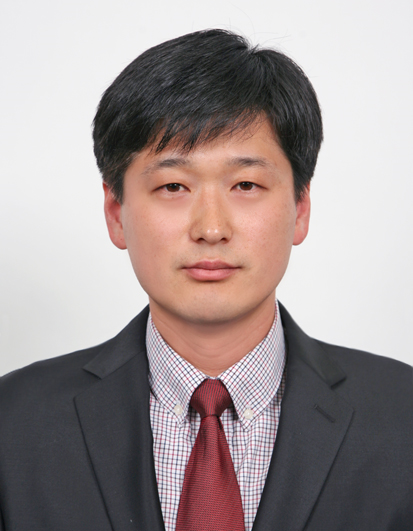 Dr. Ryu is a professor at Major of IT Applied System Engineering of Con-vergence Technology Engineering Division, Chonbuk National University. His research interest include circuit & control system and IT convergence system.